- Tool for making XSS vector under the specified conditions. Select template or input HTML source. Mark output part as ###. Check the box of blacklisted string or character. Add or remove item by right click menu. Set maxlength limit of XSS vector string. Set browser mode from IE7, IE11, Edge. Click [CHECK] button to start test. Click signature to show in built-in browser. The red items mean it can run scripts. The yellow items will turn red when script running is confirmed in the built-in browser. ex. Move mouse cursor to text box, in case of "onmouseover=". Right click and push "I", to open HTML source with Internet Explorer. Right click and push "F", to open HTML source with Firefox. Right click and push "C", to open HTML source with Chrome. 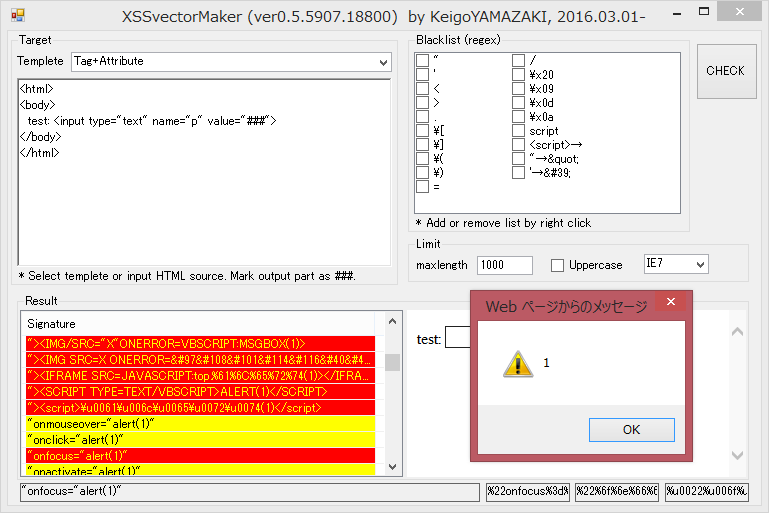 * Set browser's path to 'XSSvectorMaker.exe.config' file in advance.